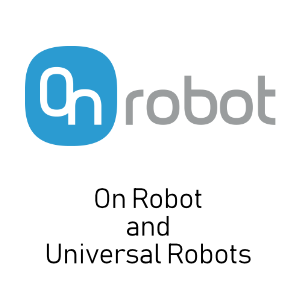 OnRobot are a Danish company who produce precision-made grippers specifically for the Universal Robots range of collaborative robots. Two models are available, the RG2 and the RG6. Both are simple to install and program. The key features of these grippers include the elimination of external cables, adjustable gripper mounting, lost grip detection and customisable fingertips. These products are officially certified by Universal Robots and X-STK are an official UK distributor. Our application sales engineers have had thorough training and can talk to you about the product’s features in more detail and can advise you on the best solution for your needs and budget. To learn more about this product or to discuss a specific application you have in mind call us on +44 (0)2920 494 551 or email sales@x-stk.com. For more information download the X-STK OnRobot brochure here or visit the OnRobot website here. 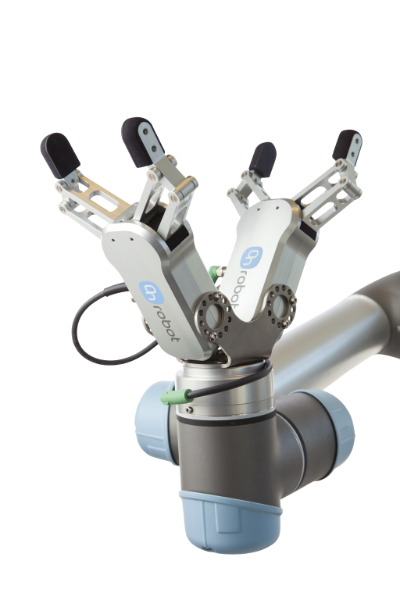 The OnRobot sensor brings the sense of touch to Universal Robot arms. The sensors are officially certified by Universal Robots and allow more tasks to be automated, helping reduce production times. 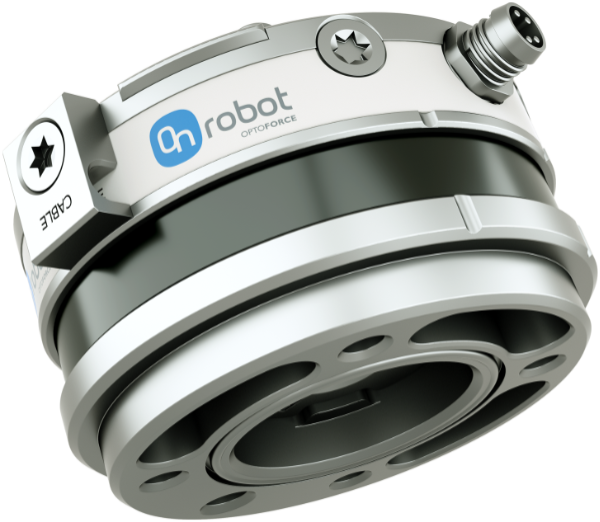 The OnRobot six multi-axial force/torque sensor can help automate many tasks that require the dexterity of the human hand. They are durable and designed to fit various industrial robot arms to carry out tasks such as polishing, palletising and stacking with speed and high precision. Other applications include centre-pointing, path recording, box insertion, pin-in-the-hole, metal part sanding and presence detection. To view or download our brochure click here. N.B. OptoForce has merged with OnRobot and has adopted the OnRobot brand – these videos still have OptoForce branding. The OnRobot Force Torque Sensor along with the OnRobot Move application fine tunes the UR's protective stop function, so even the smallest counterforces - even forces smaller than 10 N - can be perceived. The OnRobot Force Box Insertion solution helps you insert for example a radio or a battery inside the device body fast and easily. It is easy to ﬁnd the center point of an object with the OnRobot Center Point solution, even if the object is moved away from the original position. With this solution you can precisely ﬁt or insert mating parts with very high tolerances. The OnRobot Pin in the Hole solution helps to position and place any pin into a hole in a fast and precise way. 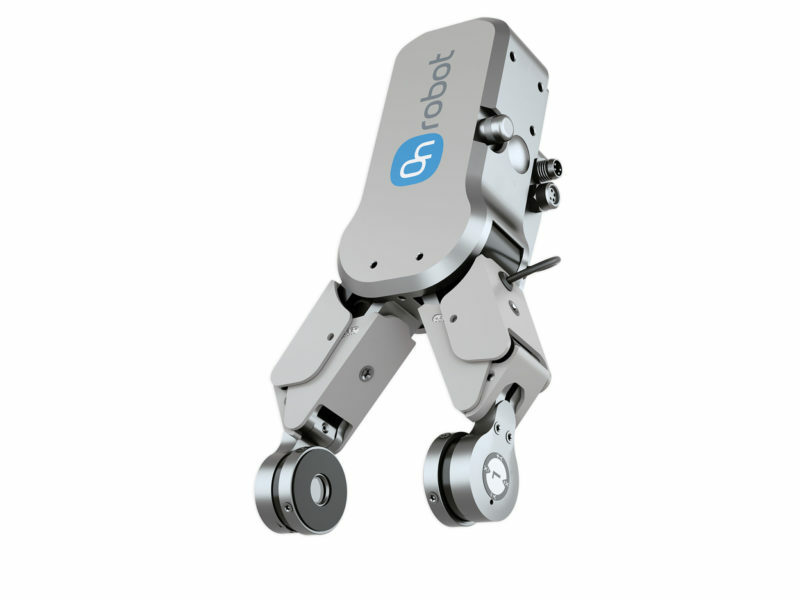 It is possible to move the UR robot by hand on all 6 axes or locking the movement of any selected axes for precise positioning. This is an easy-to-use OnRobot solution to guide the robot in a fast and precise way. A force controlled application which allows you to stack and destack products without knowing the exact thickness and the height of the stack. Stacking products into pallets with force control is also possible with our solution. Using the Path Recording function of the OnRobot Hand Guide Toolbar, you can create a program within minutes and any complex path can be easily recorded. A force controlled application which allows you to stack products into pallets which are traditionally hard to work with like ﬂexible cardboard boxes. With this solution, you can remove the parting lines of plastic objects fast and easy. With the OnRobot polishing application high quality polishing is possible, even with forces under 10 Newtons. Force controlled metal sanding, gives the robot the ability to precisely remove excess material from the machined surface. In addition to saving time and cost, it also reduces the health impacts to machine operators. FT-Produktion in Sweden turned to flexible collaborative robots and OnRobot grippers to boost productivity without growing the workforce. The new technology also increased job satisfaction, with variation to the daily routine. 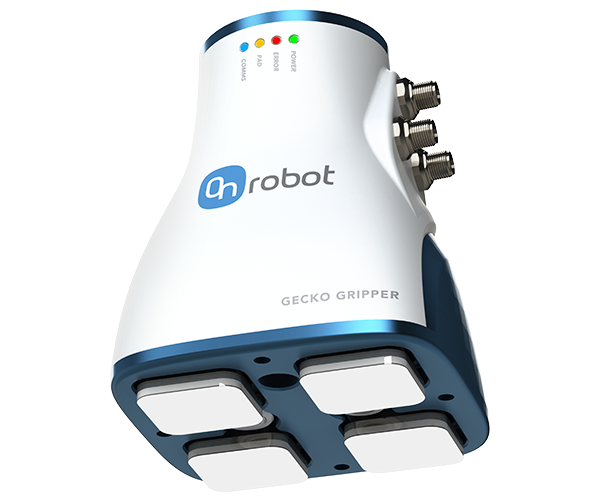 The Gecko Gripper's unique tech opens up new possibilities with applications using collaborative robots. Areas such as fabrication and handling of solar panels, metal sheets and glass sheets. With a payload of 4.1 kg, the Gecko Gripper can easily lift porous flat objects. The gripper attaches to smooth object surfaces though the same mechanism used by actual geckos, hence there is no need for air supply. The inbuilt proximity sensor enables the detection of the work piece from a distance. The Gecko Gripper is compatible with robot arms from Fanuc, Kawasaki and Universal Robots. With built-in 6 axis F/T and proximity sensors at its fingertips, the RG2-FT is the first intelligent gripper on the market that can see and feel objects. This ensures faster deployment of collaborative applications and ultimately higher productivity. The gripper’s integrated proximity sensors enable workpiece detection and centering. The gripper come with integrated force-controlled part insertion software and features precise and simple depth compensation. The RG2-FT is suitable for use in collaborative operations and precision machine tending, assembly and insertion applications where one can achieve better production quality, particularly for fragile material handling. The RG2-FT is compatible with lightweight robots from Universal Robots, and the custom interface is available in 21 languages.